When Emmy accidentally spills juice on her dad’s pants, she takes refuge behind Mom’s knee. Expecting a reprimand, Emmy is surprised when Mom tells Dad, “Now, sweetheart, you should let it be. After all…she’s only three.” What an amazing discovery! She’s too young to be punished! For the next few days, whenever one of Emmy’s creative projects ends in a wreck, she wangles her way out of trouble by proclaiming “I’m only three” and pulling a handy weapon from her arsenal of manipulative maneuvers. With a carefully aimed pout, a shift of blame, or an all-out tantrum, this girl sure knows how to always, ALWAYS get her way. But even the most understanding families have their limit, and in this laugh-out-loud story, it turns out that the limit looks a lot like an iguana in a bikini. Take a walk on the wild side with an endearingly self-absorbed little scamp who gets caught up in what she’s doing without foreseeing the consequences. Three-year-old Emmy wreaks havoc on her entire household. From spilling orange juice on Daddy at breakfast, to adorning her brother’s pet iguana in a bathing suit and letting the bathtub overflow, she’s got curiosity and mayhem covered. Krasnesky tells the story with flowing rhyme that accommodates the humor of the plot and heightens Parkins’s comical cartoon illustrations. “I tiptoed into Tommy’s room/and found a way to use the broom/to get the lizard off the shelf,/entirely all by myself.” As the star of this story gets into different sticky situations, she continually responds with the adage that “I’m only three,” so not much should be expected of her. While her mother seems to respond to the little devil’s helpless plea, it isn’t long before things snowball and Emmy finds herself in a serious time-out. Bouncy rhymed text and humorous pen-and-ink and watercolor illustrations follow little Emmy’s path of destruction. Mom, a first-class dupe, always comes to her rescue (“She told him to be nice to me. / After all…I’m only three”), but the mishaps pile up. …older siblings will be satisfied by the tale’s ending. Emmy gets away with everything—she’s only 3, after all—until her parents reach the limit of their patience, and Emmy must face a new concept: consequence. See the feature here. Definitely recommended. Wonderful, goofy-expressive illustrations, comfortable read-aloud rhyming and a solid theme make I Always, Always Get My Way a winner…. 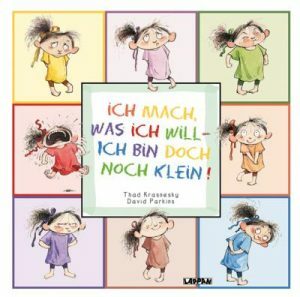 In this laugh-out-loud-funny book, the little girl uses all her wiles to get herself out of trouble until the final episode when even her usual plea that works with mum comes unstuck: ‘I sweetly answered, ”Don’t blame me. Did you forget? I’m only three.” It’s a little hard to believe that this little problem-maker is only three, but the premise is a great one – if a child is allowed to get by with murder, she will continue to cause mayhem. 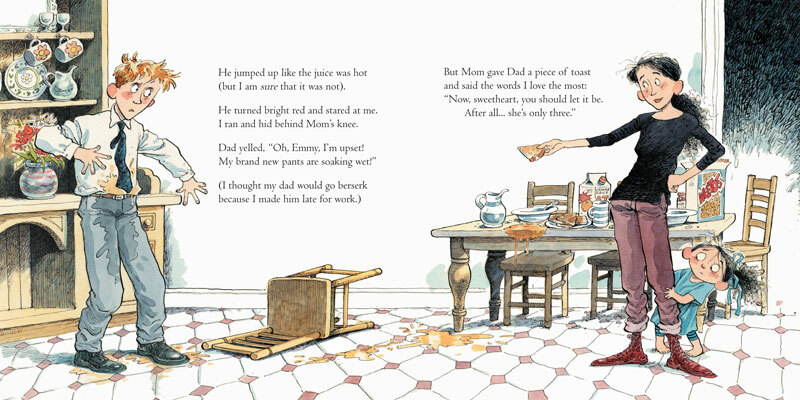 In super rhyming couplets and the kind of expressive illustrations that add miles to the text, we see this three-year-old catastrophe on legs get by with dumping orange juice down her dad’s new trousers, blaming her brother for an accident she caused herself, and using her sister’s things without asking. But what disasters! 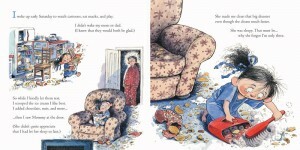 Dad twigs that all is not well when she digs a hole while playing pirates and tries to bury all the family silver. And even mum becomes suspicious when the living room is littered with broken biscuits and mess from an early morning breakfast. And then there is the grandaddy of all messes that finally brings the whole family together in knowing who is to blame. The little girl is sent to bed: ‘I sadly closed my bedroom door. I may be here until I’m four.’ The huge humour makes the point extremely well without preaching. The book should be in every young ‘madam’s’ library! 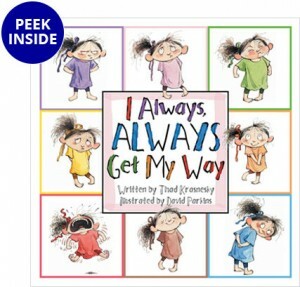 …Thad Krasnesky and David Parks have teamed up to present us with a hilarious and too often true depiction of life with a spoiled 3-year-old child. Emmy, with her large eyes, bare feet, crooked ponytail and oversized T-shirt, is the epitome of disaster waiting to happen…. David Parks has captured all aspects of an adorable and frustrating 3-year-old. Emmy is pictured from innocent, doe-eyed toddler to screaming, red-cheeked tyrant. 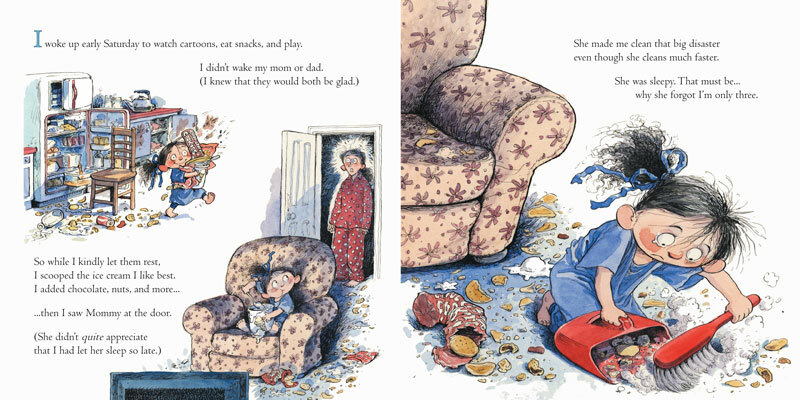 He gives each spread an element of bright-colored detail that allows the reader to picture the havoc wrought by the toddler, while using white space to draw the attention to the important aspects of the scene. Even the terror on the lizard’s face when confronted by a broom-wielding Emmy is both laughable and endearing! No matter what your age, if you have children or have any experience with the little tots, you will laugh out loud at Emmy’s antics, sympathize with her family and smile at her inevitable realization that the world does not revolve around her whims. This is a story not to be missed. — Review by Louella Moreland, Lincoln Public Library. 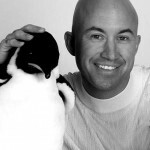 Krasnesky is an Army major, veteran of three tours of duty in Iraq, and an instructor at West Point. He’s also a splendidly accomplished children’s book author as evidenced by this rollicking, rhyming, and incisive look into family dynamics when the roost is ruled by a three-year-old. Yes, Emmy gets the best of brother, sister, mother, father, and even the family iguana by playing the just-a-little-girl card, but her fortunes turn in the end. Parkins captures it all in superb cartoon-like illustrations. The terrible two’s might bring tantrums and frustration, but the tricky three’s are all about testing limits. One of the hardest things in approaching this age is figuring out when the child isn’t old enough to understand something and when they do know better. This book is a wonderful, learning tribute to that concept handled in a light way. …a cute book about being spoiled. It is written in rhyme, and is sure to make you giggle. The great pictures depict all the trouble Emmy gets into, as well as her sweet faces, and the fits she throws to get out of trouble! This story is about a little girl named Emmy, who happens to be a very precocious three year old. She is also a smart little girl who immediately picks up on the idea that she can get away with all sorts of trouble because … she is only three. The initial incident truly is an accident when Emmy innocently spills her orange juice on the breakfast table. Of course, the juice runs straight to her Dad’s pants, who has a few choice words about his daughter’s carelessness. Emmy’s mom comes to her rescue when she utters the magic words “Now, sweetheart, you should let it be. After all … she’s only three.” Voila. Emmy learns the power of the perfect excuse. Now that Emmy has caught on, there is no end in sight to her mischief making. Since three year olds are not held responsible for their own actions, little Emmy can cause all sorts of mischief and mayhem with no consequences. Oh, boy. She takes her older sister’s things without permission, digs a gigantic hole in the backyard, muddies up her mum’s nice chair and eats ice cream concoctions for breakfast. All the trouble Emmy creates comes crashing down about her shoulders when she tries to use her “little girl” excuse one too many times. Suddenly her family realizes that Emmy is old enough to know better and to be held accountable for her actions when she behaves inappropriately. No more free passes! What a perfect book about a very important lesson that mommies and daddies, er, young children need to learn. Picking up this book is a surefire way to teach this particular lesson in a painless way. 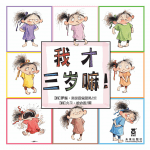 You can enjoy the rhyming text paired with funny, imaginative illustrations and feel good about the message imparted! Little Emmy always gets her way – after all… she’s only three! However, this family finally has the opportunity to see the real suspect at work and decides to teach her a lesson of her own (gently, of course). Older siblings and parents will totally connect with little Emmy’s behavior and the feelings that coincide with her always having her own way about things. However, hopefully, they’ll be learning the all too important message that this book portrays – don’t give in to to your little ones (or big ones for that matter) and let them get away with things because of that oh-so-cute face… they’ll quickly learn to milk you for all you’re worth! Choices have consequences, that’s plain to see; but it’s not always obvious . . . when you are three! Meet Emmy, a three-year old tornado who challenges her family by pushing on and testing their boundaries for her. Watch as she storms through the house, kicks up some dust, and then sits back to see how it settles. Will they be able to outlast her as she whirls in and turns their world upside down? Initially, both her sister and brother get in trouble because of Mom’s willingness to chalk it up to her age – perhaps you remember the terrible threes? But that excuse wears thin and, in the end, despite Emmy’s amazing attempt to divide and conquer, both parents are able to see that, regardless of her age, this little twister needs to be held accountable for her actions. With a little bit of luck, the reflective time-out in her room will be just what she needs to teach the somewhat-spoiled sister that she does NOT always get her way. David Parkins’ eye-catching illustrations are precious as he brings to life author Thad Krasnesky’s little heroine and her creative commotion. This whimsical tale is sure to entertain and connect with anyone who’s ever had a sneaky sibling. Once the laughter has subsided, it might also spark an interesting discussion about choices and consequences. From Christine Hohlbaum, author of S.A.H.M. …a laugh-out-loud story, screaming to be read to your kids! 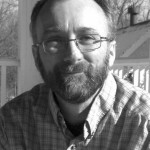 Thad Krasnesky is a master storyteller. Through the expert illustrations of David Parkins, I Always Always Get My Way is a sheer delight to read and experience. With its rhyming storyline, a cast of loveable characters, this book will quickly become one of your child’s all-time favorites. Very highly recommended. Kids will love to see Emmy get away with so many misdeeds. …They will be left wondering if her behavior will ever catch up with her. Curiosity will keep them enthusiastically reading to find out Emmy’s fate…. Thad Kranesky, uses delightful rhyming text to bring humor to the story that leaves the readers laughing at Emmy’s shenanigans…. David Parkins masterfully conveys Emmy’s many emotions through his drawings…. Children, parents and caregivers will enjoy sharing this book together. Error: Error validating access token: Session has expired on Sunday, 23-Sep-18 01:36:16 PDT. The current time is Friday, 26-Apr-19 01:03:41 PDT.